For decades the citizens of Pasadena have lived in a divided city. In 1964 the State of California seized a large swath of Pasadena’s most valuable land, demolishing thousands of homes in order to extend the 710 Freeway, connecting it to the 110 and the 210 Freeways. 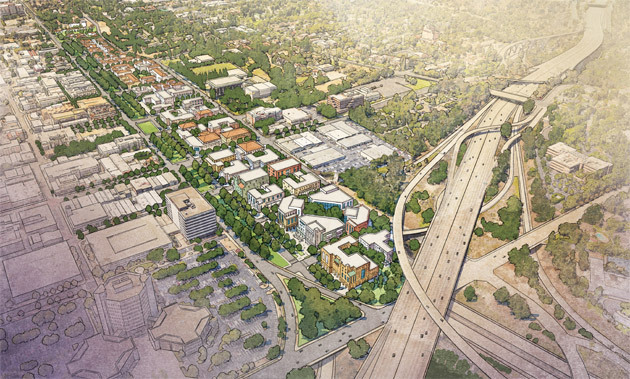 The freeway stub as it exists now interrupts the street grid of neighborhoods to the east and west and separates Old Pasadena from the Ambassador Campus and Auditorium, Maranatha High School, the Norton Simon Museum, and many businesses. 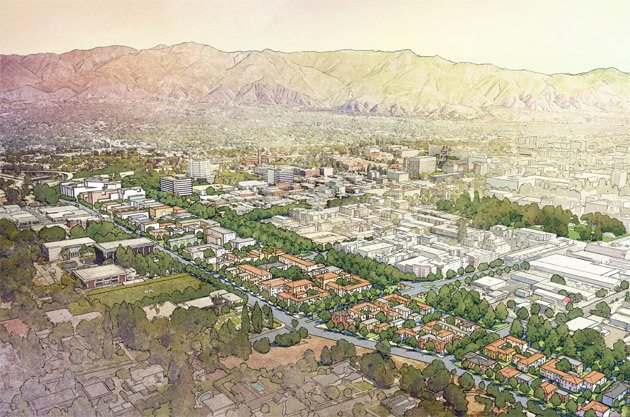 The Connecting Pasadena Project is a community-based initiative that aims to reclaim this land, rebuild the urban fabric and restore the economic and social activity that was destroyed over fifty years ago. Two separate workshops were organized during which participants gave input and provided programmatic direction for the framing of the project, which is based on five principal ideas: 1) Fill the freeway stub with parking and other service uses; 2) Convert the freeway into a multi-lane boulevard as it enters the Pasadena; 3) Create a new network of blocks, streets and open spaces to stitch together the disconnected sides of the City; 4) Use the reclaimed land for new infill development; and 5) Regulate development in a form that is sensitive to the surrounding context.